Scientific Name(s): Shepherdia canadensis (L.) Nutt. Photographer(s) Appreciation: Today's photo features the inflorescence of Shepherdia canadensis, a common berry-producing shrub of western North America. Anne Elliott (aka annkelliott@Flickr) took this macro photograph in South Glenmore Park, Calgary, Alberta (Canada). Thanks Anne! Shepherdia canadensis, also known as soopalallie or buffaloberry, is an important species for grizzly bears (Ursus arctos). The online field guide, MountainNature, advises hikers in the Canadian Rockies to become familiar with this species, so as to avoid late-summer hiking on trails where it grows plentifully. According to the field guide, an adult grizzly will eat upwards of 20000 soopalallie berries in August and September. David Hamer, in the journal article Shepherdia canadensis is a spreading, deciduous shrub species that grows to 1-2 meters in height. The branches are grey-brown, and covered with rusty spots when young. The inflorescence of soopalallie is described as inconspicuous, but this macro photo makes it look downright strange. Today’s photo clearly shows the 4 yellowish-brown sepals and 8 stamens that make up the male flower. Shepherdia canadensis is dioecious. The female flowers have the same oddly-coloured sepals and lack of petals as the male flower, but have one pistil rather than stamens. 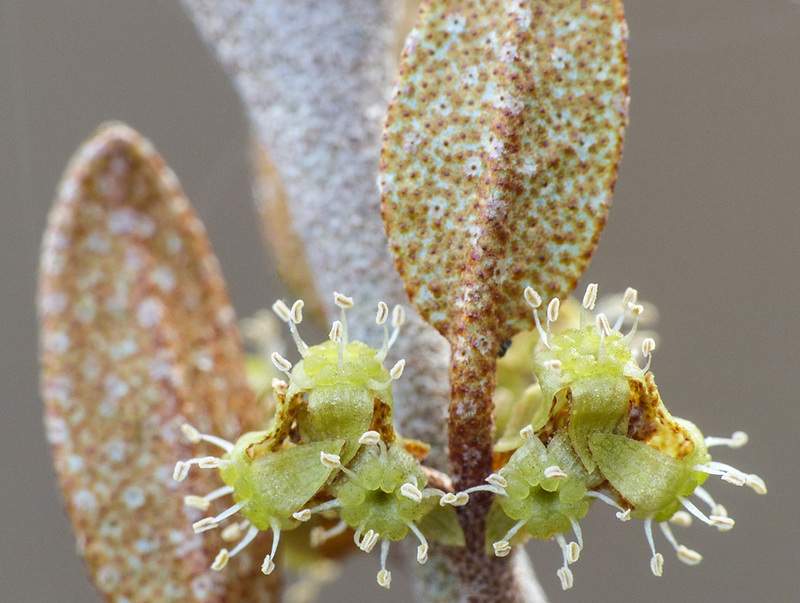 When pollinated, the female flowers form an edible, but very sour, red berry that is 4-6mm across. These tart berries are the main ingredient in sxusem, or “indian ice cream”, eaten traditionally by many North American First Nations peoples. In order to make sxusem, Shepherdia canadensis berries are collected by whacking the shrub with a stick so that the ripe berries fall onto a mat. The berries are then placed into a container (it cannot be plastic or oily, as this will prevent the berries from frothing), crushed, and whipped with water until foamy. Other berries are often added to sweeten the “ice cream” (contemporary recipes usually include sugar or some other form of sweetener). A chemical compound found in the berries, saponin, is responsible for the soap-like foam that is produced. Goodness! That looks like something that would grow on Venus! No mention of buffalo in the article. Maybe it should be called grizzlyberry. We have this plant on our property here in northern Idaho but, fortunately, I’ve yet to see any grizzlies. Good info to know next time I ever hike in Montana, Alaska, or Canada.